Think of the Clyde as split into two different jurisdictions, Naval Dockyard waters and Clydeport waters. QHM (Queen’s Harbour Master) is the statutory harbour authority for the dockyard waters and Clydeport Operations Ltd for the rest of the Clyde. or download here this latest Gareloch & Loch Long Order applicable from 21st July 2011. “5. 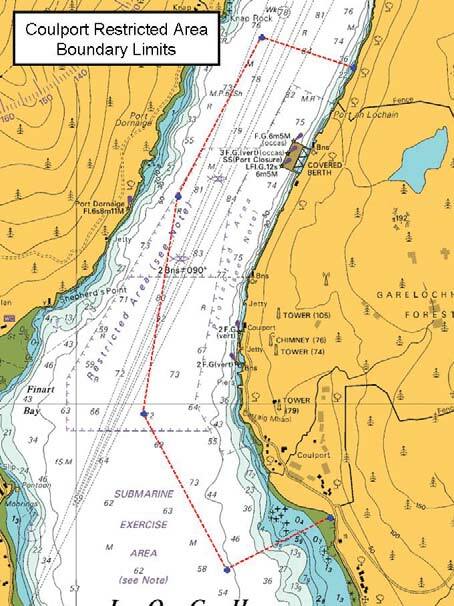 (1) Within the limits of the Rhu Narrows Restricted Channel; the Faslane Restricted Area; the Coulport Restricted Area and the Coulport Fishing Exclusion Zone, the speed of any vessel shall not exceed seven knots through the water unless a speed in excess of seven knots is essential for the safety of navigation. (2) Elsewhere within the dockyard port, no vessel shall exceed twelve knots through the water. If any vessel shall not exceed 7 knots through the water, or if, to ensure safety of navigation, it is necessary to exceed 7 knots, shall be no greater than the speed necessary for this purpose. The 7 kns speed restrictions only apply to the small areas indicated i.e. 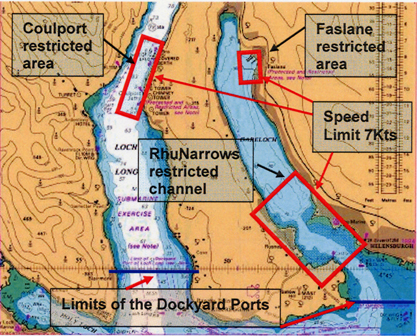 Coulport, Rhu Narrows and Faslane however the 12 kns speed limit in our area applies to the whole of Loch Goil and Loch Long up to the Dockyard Ports Limits across from Blairmore to Cove Bay as shown on the plan below. If you travel at any speed above 12 knots you are exceeding the speed limit! The police can monitor you by radar so would know what speed you are travelling at within the QHM waters which is why they can and do stop vessels. The fine for exceeding the speed limits is £1,000.00. For all areas outside QHM waters, Clydeport waters, ‘NTM 03/11 – Safe Speed’ applies –http://www.clydeport.co.uk/cms_uploaded/NTM_03_11_-_Safe_Speed.pdf. It should be noted that the byelaws place a speed of 5 MPH as ‘deadslow’ and technically you could be in the wrong for exceeding this at places where deadslow is required, i.e passing docks, pontoons, ferry landings etc. Commercial traffic appears to follow the NTM (Notice to Mariners) which requires a safe speed so they alter the speed of a vessel to match the wash generated from the vessel to minimise any possible damage to other craft or facilities on the river. The 12 knots speed limit on areas above Cloch Point is promulgated for small craft in the Clydeport Leisure Guidehttp://www.clydeport.co.uk/cms_uploaded/Clydeport_Leisure_3rd_Ed_web_%282%29.pdf. If you need to contact the MOD Police call up on channel 73. Personal Water Craft (PWC) must obtain a licence to be used in Loch Goil from the Queen’s Harbour Master. Also click on Important Navigational Information for Loch Goil. Those wishing to use the visitors’ mooring are asked to pay a £10 mooring fee per day/night that will go towards the annual servicing of the moorings.